I had the pleasure to attend the Billboard Music Awards where Prince received the 2013 Icon Award. I was excited to arrive at my very first awards show at the MGM Grand Arena in Las Vegas May 19. Once I was inside the doors, it felt like I was attending a concert with several megastars on the bill (think Budweiser Superfest or the like for all you triple O.G. 's like myself out there). All the fans were suited up and I think there were a few women who even busted out some old prom dresses for the occasion. The crowd's buzz was energizing. Besides the usual concession stands for food and alcohol (where they got me for $8 for a bottle of beer). There were also places to buy souvenir programs and more practically, rent binoculars, so us fans in the upper level, also know as the nosebleeds, could better zoom in on our favorite stars. Pretty clever. I said to myself "How come I didn't think of that?" I flirted with the idea of the renting them (for $10, plus a $25 deposit). But, once I got inside and got to my seat, I realized I didn't need them. I was in the fifth row of the upper level, but, it wasn't actually a balcony. The only thing separating us from what would be considered the mezzanine level was the entrance and another barrier. In fact, the way the arena was set up, there really wasn't a bad seat in the house. I could see from my section, that hardly any of the celebrities were seated in their designated chairs that early (about an hour before the show was supposed to start). I can't say for sure, but, I am fairly certain that Prince was never seated in the audience at all. The fans in the pit section in front of the stage could see all the stars being quickly ushered to their seats right before the show was set to begin and you could hear occasional cheering from that area. Finally after many announcements, the show kicked off when Tracy Morgan made his entrance from backstage. I'll be honest, I don't really think he's funny, but, that line he said about Wayne Newton being his biological father was priceless. Personally, I was a bit surprised to see Mr. Las Vegas at the Billboard Awards. Let me just put out a disclaimer: Although I am familiar with the majority of the stars in the night's lineup, I am not familiar with their music, so, it was all new to me. The show kicked off with Bruno Mars, who sang "Treasure," and I was very impressed. He and his band (bands were a rare sight during the show) were decked out in their red suits, daringly unbuttoned black shirts and gold chains. The song was bangin' and the choreography was tight. The set reached back to the days when groups like The Jacksons, Earth Wind & Fire, The Commodores, The Ohio Players, Cameo and so many other legendary acts ruled the radio airwaves and concert stages. It was a great way to start the show. The sibling trio, The Band Perry, performed after Selena Gomez, who was second act of the night. They sang they their hit "Better Dig Two" and it was great. They were another live band (note to other performers, it does make a difference) and when they did they their drum solo mid-stage toward the end of the song, I thought this was a sign of more great performances to come. While sitting in the audience, I was not aware Prince would be the very last act of the night. Most fans have now tagged it on social media sites as "saving the best for last" and I would agree. Not all of the following performances were horrible, but, a lot of them sounded the same. It seemed as if everyone, except me, knew the words to all these songs. I've never felt so elderly and out of touch. It sounded like a hodgepodge of electronica/pop/hip-hop where one song was barely distinguishable from the other. The performers included: Icona Pop; Jennifer Lopez; Christina Aguilera (who sounded great, but, whose song I didn't care for); Chris Brown (doing his best Michael Jackson impression, but, it was a decent one); David Guetta, Akon and Ne-Yo and Seattle's own Macklemore and Lewis (I loved the shout out to local thrift store chain Value Village), whose performance we viewed by a feed from the Wynn Resort here in Las Vegas (Why? I don't know). However, it was interesting to see dancers rehearsing on one side of the stage for what was later revealed as Taylor Swift's "22" number. Also, Justin Beiber, performed twice (as well as Pitbull who performed with Aguilera and Lopez), the second time with will.i.am. Bieber (who, on a side note, looked like a New Kids on the Block throwback) was booed by a large section of the audience for several seconds when accepting his second award. I may have been sitting in the Team Bieber section, but, the rest of the audience was not having it. I must say, the kid looked caught off guard. He attempted to give his speech, but, was stopped midway by the incessant sound of disapproval. There were some screaming girl fans who tried to counter it, however, the damage had been done. It was truly surprising. All the musical monotony was broken up by the occasional award, parade of presenters (including many ABC TV network stars) interesting asides (when Kid Rock said "Let's give it up for performers lip synching to pre-recorded tracks," I swear I thought I heard him wrong) and occasional epic fail (think Miguel's botched airborne attempt). Madonna, whom I hoped would perform, came out to accept her Top Touring Artist Award with an outfit that consisted of little more than a fitted coat, leotard and stockings and garters. She wore it with such panache that one could be convinced it was formal evening wear. However, the commentary between the two twenty-something girls seated behind me overshadowed her detailed, if meandering, speech: "You are the queen," "Ummmm...aren't you going to thank your fans? (This was before she finally did)," and "She must be at least 68 by now." Dear Lord. It turns out they were sitting in somebody else's seats, so, they had to kick rocks. It even seemed like the same people were winning all the televised awards (the night belonged to Taylor Swift). But, there were some pretty cool interactive moments during the show. When we all entered the venue, we were given small lights that we were directed to later point at the stage during Ed Sheeran's performance, that created the effect of a starry night sky in the darkened theater. Also, fans who downloaded an app before the Icona Pop set, pointed their smartphones toward the stage during the set and it created a glow of warm light in the audience. Finally, after Nicki Minaj and Lil Wayne performed "High School" -- I'm curious to know how much home TV viewers saw of that oh-so-convincing lap dance-- it was time for the highlight of the evening. Prince was getting his award. Morgan came out and introduced Erykah Badu and Janelle Monae (the perfect people to give this tribute, in my opinion). They were decked out in the most innovative attire of the evening—Monae's seemingly inspired by Prince, circa 1984 and Badu's, in my opinion, bought back the very best elements of Parliament/Funkadelic. Her blond wig prompted also the now forty-something ladies behind me to wonder aloud if she was actually Mary J. Blige. Again, Dear Lord. Badu and Monae seemed thrilled to be handling the honors. I was happy to see them. They gave a short speech introducing Prince as the recipient of Billboard Music Awards' 2013 Icon Award, which led into a video montage of Prince's performances, achievements and general impact on the music world. I enjoyed it and I was looking forward to a speech where Prince might further expound on these points. But, that night, he decided to let the music speak for him. As soon as the video ended, the proverbial curtain came up on stage right (there were two individual stages were separated by a platform and short staircase where presenters descended from backstage to give out the night's awards) and Prince and 3rd Eye Girl—Donna Grantis, Hannah Ford and Ida Nielsen-- launched right into "Let's Go Crazy (Reloaded)." The audience was instantly on its feet and Prince began his reign over night's awards. His lime green ensemble topped with a black fringed jacket was eye catching. His afro, which caused chatter among fans in the stands-- "Look, he has a fro!" was shouted several times by some lady nearby-- was perfectly rounded. They rocked it out and singlehandedly put to shame the artists that came before him, with the exception of the artists two I singled out for praise above. The band sounded tight and they flawlessly segued into their newest single "Fixurlifeup." Then they went back and wrapped it up with "Let's Go Crazy." Then, as soon as the last note sounded in the perfectly clean rock and roll finish, the proverbial curtain came down and that was it. Morgan came out and thanked everyone for coming out and, like that, the awards ceremony was over. The band had come to out to remind us why Prince deserved the Icon Award. I'm not trying to be snarky, but, Prince and 3rd Eye Girl could have come out and sang the alphabet and it still would have been more inspiring than some of the acts I saw that night. I would have loved to hear a speech from Prince. In all honesty, it would have made my night. But, he must have had his reasons for not giving one, which I will not speculate on here. But, I will say that maybe he thought it was a night where actions spoke louder than words. Let me be the first to say they did. 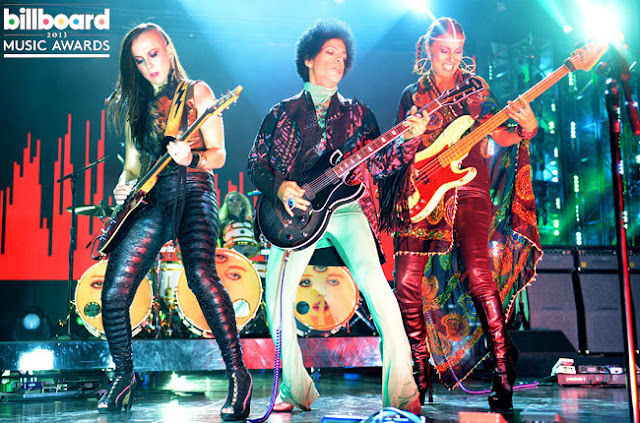 Lead photo: Prince and 3rd Eye Girl. Courtesy of billboard.com.